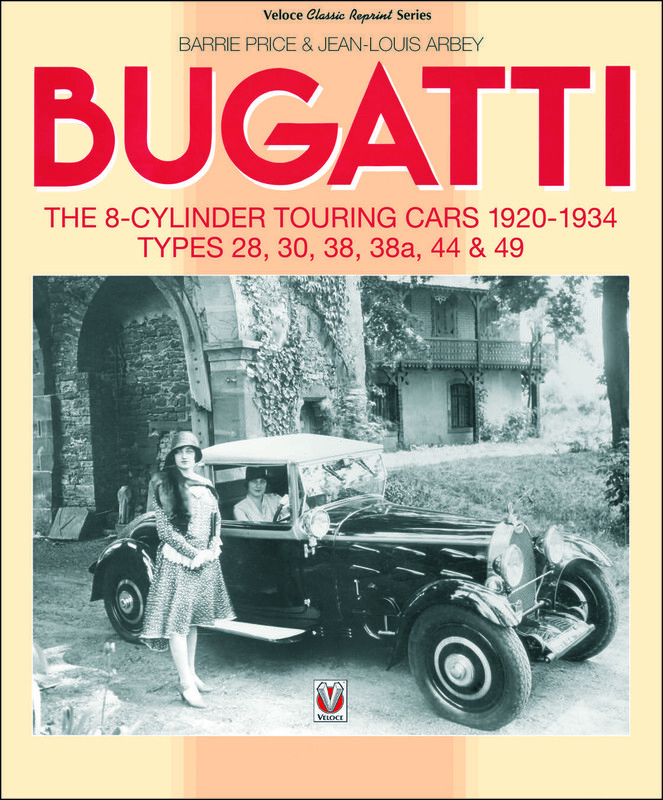 Reprint in the "Veloce Classic Reprint Series"
These post WW1 8-cylinder sporting touring cars were the most successful Bugatti models until the advent of the Type 57, and typify Bugatti style, design and innovative automobile engineering. Here is a thorough study of these great cars by two renouned experts and with the assistance of the Bugatti Trust. Over 200 photos and drawings. A detailed study of the medium sized touring cars in the extensive range built by Bugatti during the fifteen years following the 1914-18 war. Aspects of design and development are considered together with pictures of components and chassis commencing with the Type 28 culminating with the Type 49. These cars represented the bulk of production and typify the Bugatti style and design, which was the basis of the company's unique standing in the field of automobile engineering. Over one hundred and fifty different cars are depicted via over 200 principally contemporary photographs, many of which have not been published before. The works of many different coachbuilders, throughout Europe, built upon these chassis are illustrated together with tables showing their market position compared with other makes and models, which were competitors. A study of the performance of these cars in competition is included together with a survey of the fall and rise in values over eight decades. The book represents an important addition to the series already produced by Veloce covering models Type 40, Types 46/50 and Types 57/57S. The royalties pass to the Bugatti Trust, a foundation dedicated to the study of the works of Ettore Bugatti and the furtherance of aesthetics in engineering design. Comment by J.J. Horst: An interesting book, though it doesn't really cover all types mentioned above. It is principally about the T44 and T49, with a lot of period photographs, with several body types and photographs not seen before. However, it is not as thorough a study as compared with some of the recent books, though it makes interesting reading, very similar to the former books on the T57, T46/50 and T40. This new reprint (at an increased price, even for a softback) is identical to the 1st print, retaining the errors in the first edition. Pity that the book is in black & white only, at this price a book with part colour pages should be more than possible.